I’m in a crumbling 18th Century townhouse. It’s dark in here, almost pitch black. The walls echo with the sparse chimes of some twisted nursery rhyme. Shadowy figures pace around menacingly in the murk. 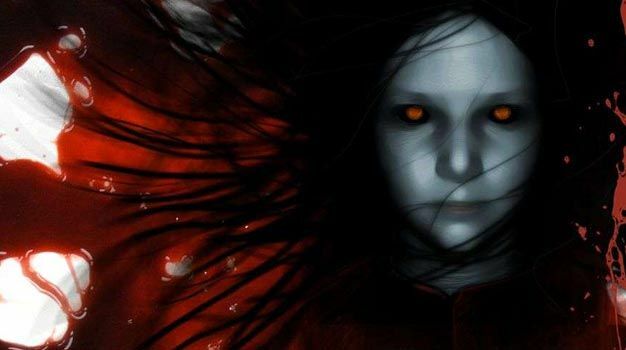 From the corner of my eye I catch the image of a young girl – motionless, expressionless, legs splattered in blood, face masked by sheets of dark black hair. It’s Alma, her psychic rage capable of liquefying skin and leveling cities. She’s right here next to me. No, I’m not playing the game, this is actually happening. Never say videogame journalists have it easy. So maybe I’m overdoing it a little. I’m in a spooky old London house for a special preview of F.E.A.R 2: Project Origin and the darkness, looping game soundtrack and life-size Alma poster is starting to freak me out. Alma is, of course, the character at the center of the paranormal action in Monolith’s 2005 game F.E.A.R.. Imprisoned and experimented on as a little girl by those attempting to exploit her considerable psychic powers, the end of the game sees Alma escaping her tormentors and unleashing a massive psychic explosion, destroying the city and threatening to subvert reality. Project Origin begins 30 minutes before that event. The game’s intro throws you directly into a hellish urban environment of concrete and twisted metal. It’s a destroyed cityscape, but not the kind we’re so familiar with from the likes of Gears of War or Resistance. Above the remains of the city the sky blazes red, a sea of psychic flame and fire. The air around you is alive with paranormal effects, like some blazing ticker-tape parade. It’s simultaneously beautiful and horrific. But it’s just a vision, courtesy of Alma. Or at least it seems to be. As in the original, Alma is capable of linking with your mind. The line between truth and hallucination is continually blurred. It’s a trick pulled throughout the 4 levels of the game I got to try out and it’s highly unsettling. You can never relax, never fully understand where your reality begins and where Alma’s takes over. Within 2 minutes of the opening section Project Origin already had me jumping out of my seat. Trust me, this game has atmosphere in spades. You are Michael Becket, Delta Squad operative. The first level sees Becket and the rest of the team scrambled to arrest the person responsible for Alma’s imprisonment, Genevieve Aristide. Aristide lives in an exclusive apartment block littered with modern art, sculptures and china. Making your way through the building in order to reach her penthouse suite, it’s not long before you encounter Replica’s, the Combine-like military clones from the first game, intent on reducing you to a bloody mist. Combat is visceral; rifle shots crack, body parts explode and the environment cracks, shatters and disintegrates around you. It’s incredibly filmic. The developers are keen to talk up the John Woo-esque action in Project Origin and you can see why. A.I. is also impressive, the enemies show a canny awareness of the environment – flanking, creating cover and concentrating fire on nearby explosive objects. Nothing is scripted, in any given situation they will find a way of flushing you out. Put simply, anything you can do, the enemy A.I can and will do also. Very rarely were we reduced to waiting for Replica’s to repeatedly pop out of cover, Whak-a-Mole-style. Projected onto the inside of Becket’s goggles is the HUD. Unfortunately, the lines, (partly-regenerative) health bar and weapon info, comms panel and other data clutters up the screen a little. The HUD was designed to maximize immersion, yet I can’t help but think that post-Dead Space -– where the developers managed to achieve an entirely HUD-free experience — the opposite is achieved. That’s not to say there are not successful attempts at immersive gameplay, however. There is a great sense of physicality when controlling Becket. His movement is satisfyingly weighty, the camera bobs convincingly as you walk. When vaulting or repositioning an object you see limbs in action and realistic momentum. You’ll find no floaty FPS controls here. One of the criticisms thrown at the first game was its dull environments; a series of constricted grey corridors. It’s something that Monolith has been vocal about addressing in Project Origin, opening up the game’s combat arena into more varied, expansive areas. Our first real evidence of this comes in the level ‘Top’. Here, Beckett must protect the rest of the team from a rooftop, sniping enemies in adjoining buildings, then making your way through with some close quarters combat. It’s here that bullet-time comes into play. 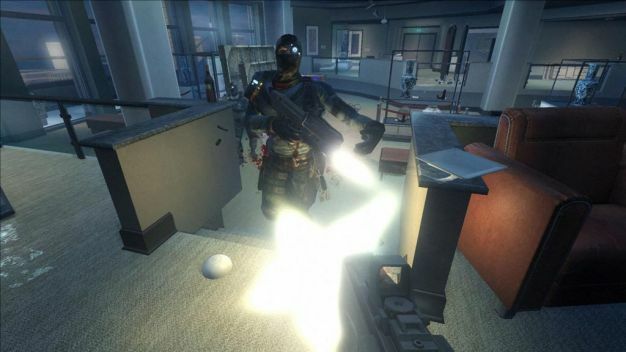 By this point in the game Becket has been equipped with lightning quick reaction times, similar to the Point Man in F.E.A.R. One click of a button and time slows to a crawl, enabling you to create carnage. Now a tried and tested gameplay element, bullet-time slo-mo was relatively novel in the first game. But while its presence here will win no points for originality, it’s still fun and essential for taking on some of the more hectic sequences. Put simply, there’s nothing like hitting that button and blasting the crap out of everyone. Deeper into this level we finally get our hands on the Mechs. Another example of Monolith listening to feedback for the original game, operational Mech suits or ‘Elite Power Armor’ were high on the community’s wish list for the sequel. Monolith delivered. Jumping into the suit completely changes the shape of the game, allowing you to turn the tide on your enemies. Tactical positioning, cover creation, environmental exploitation – forget it. You play the tune when suited up in one of these babies. Step into one and you can start tearing stuff up. Get too careless though and you’ll find yourself without operational armor, outnumbered and outgunned. You won’t last long. Not all of the combat is against Replicas. The next level, ‘Elementary,’ takes place in a school where we are introduced to spectral foes. When Alma unleashed her psychic explosion it affected the population in different ways. Remnants, similar to ‘ghosts’ in System Shock or BioShock, are victims of the blast doomed to act out their last actions ad infinitum. The example here is a piano teacher, playing out his life over and over. Steer clear and he will continue to do so, but disturb him and you’ll have to deal with the consequences. Enraged by interruptions, remnants become horrific puppet masters, able to reanimate corpses and send them after you. Marked by a series of red string-like energy lines, these corpses swarm you and can do a lot of damage should they get too close. To make things even more difficult, ‘killing’ them only temporarily incapacitates them. To stop them, you must take out the remnant. No easy task with 5 corpses breathing down your neck. In the last level we were shown, Becket must make his way through Laboratories in order to track down the enigmatic Snake Fist. Here Becket has to employ all the tricks he has learned thus far, fighting off Replicas as well as the freakishly contorted Abominations. The labs are infested with them. Crawling on walls and ceilings, they come at you from all angles. Indeed the A.I dictates they take the least direct route to catch you from behind. It’s intense stuff. Even when they are not around, you find yourself obsessively scanning the walls and ceilings. Creepy. More than anything, our limited time with Project Origin shows that Monolith have gone to great lengths to improve upon the first game. The engine used to power Project Origin is a vastly improved and enhanced version of the one that drove F.E.A.R., the environments are more varied and larger, enemy types are broadened beyond just replicas, the already impressive A.I. has been built upon substantially. Basically, every element of the original is improved upon. But the FPS landscape has changed since F.E.A.R launched 3 years ago. The market is flooded with decent quality shooters and standing out from the pack is increasingly hard. Add to that the advances made by games like Halo 3 and Call of Duty 4: Modern Warfare and you see what Project Origin is up against. From the little that we have seen, there is no doubting that it has all the elements of a good game. But to truly stand apart, everything has to come together to make something great. 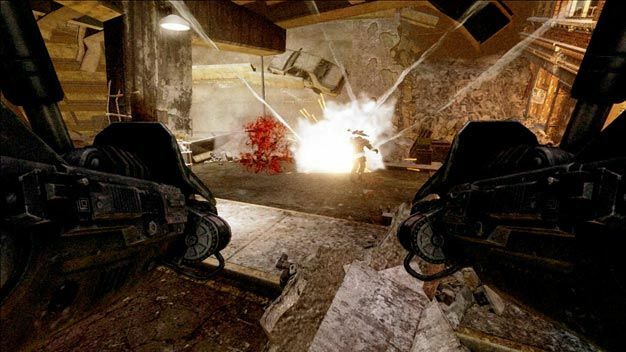 If F.E.A.R 2: Project Origin can achieve this then it may just be one of the best shooters of 2009. Check back tomorrow for our interview with Monolith’s Dave Matthews, the primary art lead on F.E.A.R 2: Project Origin. Among other things, there will be talk of movie influences, dead birds, and how they’ve kept the fear in F.E.A.R. 2.